I hope all of you are doing Great today. I have a new update/video of Charlie (who is now going into his eighth week of life here on Earth). Everything is going great with him. He's growing super fast now and definitely is the chatty one of the two as well as the most spunky. There are differences between the two chicks that are definitely highly distinguishable. Charlie stands tall, highly mobile, highly talkative and generally displays the behavior of a male bird. The other little chick-a-dee shows behaviors that are more in-line with a nesting type of behavior. "She" tends to crouch down the majority of the time with extended neck is a bit less attention getting. The breeder and I both suspect that indeed, Charlie appears to be a boy (given his behavior and the shape of his head—flatter on top as well as the overall shape). She's also becoming increasingly convinced that the other chick is a girl given her developing looks and overall behavior. None-the-less, we will be DNA testing Charlie as soon as his feathers really start to come in! Then I will be able to share his/her Gender Reveal!! YAY!! So, be sure to bookmark our site, or you can Subscribe to our posts via the box over there to the right (or below on this page if you are using a mobile device). Our email subscription is run totally by Google (as well as our website), so, there are no worries in the safety of your email address. I never see your email address. It goes right to Google to run and manage. What I like about the Subscribe by Email that we have on here (and I've tested it out myself) is that you can watch our videos Directly within the body of your email!! You don't even have to leave the email message to view our posts. So, that's Cool! Also, by Subscribing via email, you will receive All of our New YouTube Videos directly in your email to watch there as I post them on the site! 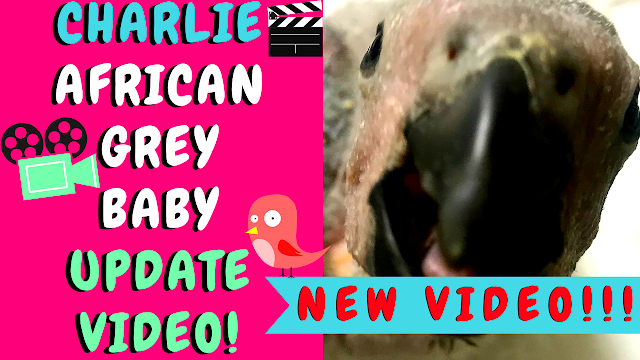 Ok, below is our latest video of Sweet Charlie and his sibling. He is the baby in the back. This video is adorable because you see that it's feeding time and they are trying to feed each other! It's SO Cute!! And those baby dinosaur sounds! I hope you enjoy it as much as we did! Thanks for Visiting! And if you haven't Subscribed to our YouTube Channel, you can do so by CLICKING HERE! Be Sure to Hit the little Notifications Bell so you don't miss an Update! Thanks Again Guys!! Have a Great, Positive, Happy Upcoming Week!